Hawtan Leathers is one of the leading global manufacturers and distributors of finished and unfinished leather. Thanks to everyone who donated to the Hawtan Haiti Relief Fund. We exceeded our goal and are so grateful for the help you are providing to the people of Haiti. Hawtan Leathers, LLC is one of the leading global manufacturers of fine leather. Located in Newburyport Massachusetts USA, we offer a variety of finished & unfinished leather products including goatskins, cowhides, deer skins, naked leather and custom leather in an assortment of colors and textures to meet the unique needs of each customer. We distribute our leather to leather glove manufacturers, leather garment manufacturers, leather upholstery manufacturers, and a variety of small leather goods manufacturers. 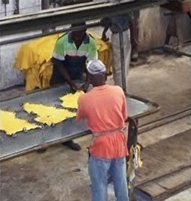 Hawtan Leather operates Cuirs Hawtan, S.A., located in Haiti and one of the largest tanneries in the Caribbean, placing us among the premier international leather suppliers. Read about Hawtan’s sponsorship of the Emmys on Sunday, September 17, 2017.